This article will offer a clear overview of the ProForm 505 CST treadmill, including its features and recommendations. ProForm 505 CST Treadmill is an ideal fitness equipment that you could start with to put up your home gym. It is an excellent treadmill whose quality matches its price. The entry-level fitness equipment comes with great features that help you enjoy a wide variety of workout options. This quality treadmill is designed to get you moving. Beginners can rely on this equipment for their daily workouts. 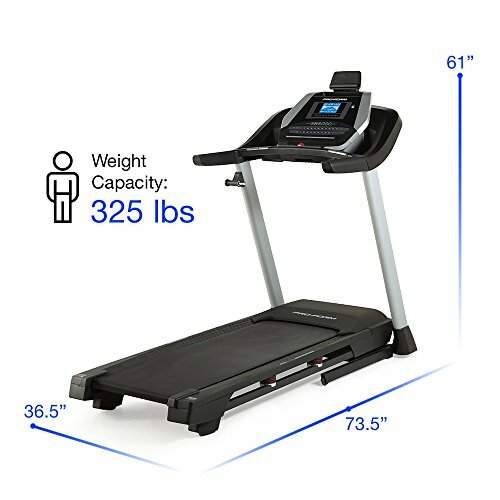 The ProForm 505 CST treadmill includes a folding option that hoists the running platform to a comfortable diagonal so that you can save on floor space when you’re not using it. 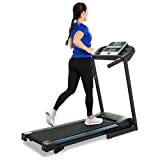 It is also fitted with a large LCD that displays calorie burn, speed, mileage, time add up, and your heart rate to let you keep track of your workouts.The treadmill also comes with 18 workout apps, from which you choose. The tread belt is also spacious enough to allow a comfortable workout – it measures 20 x 55 inches. This treadmill comes with QuickSpeed controls that let you choose from 0 to 10 Mph. Its deck area is fitted with ProShox cushioning to allow you to work out comfortably for longer. Moreover, its handlebars are fitted with hand-grip sensors that track your heart rate throughout your workout session. Interestingly, the ProForm 505 CST treadmill is designed with a compatible music port for your iPod. As such, you can enjoy your favorite tunes as you work out. You can use the ProForm 505 CST treadmill to perform walking lunges. Walking lunges are often hard to perform at the gym. This is because most public gyms have limited space. However, this treadmill will allow you to carry out this routine efficiently and to get the most out of it. It is also the ideal option for cardio training. This fitness equipment needs to be taken care of properly to enhance its longevity and functionality. It comes in a box, and all the parts come assembled. You will only be required to lock the items into place to start exercising. It does not require much to disassemble it either. You can grease the wheels that it comes with in order to allow for an easier transition within your house. Ensure to keep it in a position that does not affect movement within the house. This means that this is a long-lasting product that will serve you for long. You will also get to save on spare parts and maintenance. This treadmill can be accessorized with iFit. The ProForm 505 comes fitted with 18 workout programs that can help you go through your workout routine with ease. However, you can upgrade it with iFit. This is an excellent program that is powered by Google Maps. Basically, it allows you to compete online with other users from all over the world who are iFit members. You can also use it to train. It also features customized workout routines from Jillian Michaels. To use it, however, you need to buy the adapter. Price: Compared to other treadmills, the price of ProForm 505 is quite reasonable. This is a reputable brand whose impressive value matches up to the tag. 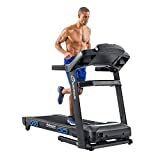 Program variety: For a beginner’s treadmill, this fitness equipment has 18 built-in programs, which is quite impressive. You can use any of these programs to achieve desired outcomes. Folding design: The ProForm 505 has a folding design that makes it ideal for storing in small places. This design also helps you save on space. Warranty: The warranty on this equipment is quite impressive. It features a lifetime warranty on the frame, 25 years on the motor, and 1 year on parts. Audio capabilities: The treadmill comes with two speakers. It also has iPod compatibility. It does not have a wireless heart rate monitoring. The equipment’s assembly can take you up to 2 hours. It can only do speeds of up to 10 mph. 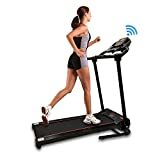 The display on the treadmill is basic compared to other models. 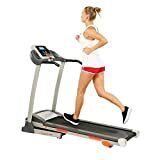 Some users say that this treadmill features excellent performance because it’s fitted with some cushioning. This feature softens the blow to your knees and feet when you’re exercising .On the other hand, others say that the treadmill does not measure the heart rate accurately. Its inability to measure a user’s heart rate makes it unreliable. Other users say that it is too heavy. However, it has a good price while most of its features have excellent quality. Other users report that the speakers it comes with are not very good although they are louder than smartphone speakers are. Some buyers have expressed disappointments because of the ProForm 505’s poor durability. Most users reveal that it stopped working after less than two years of use. Despite its relatively short life, the treadmill works greatly, and its assembly instructions are easy to follow. Despite its shortcomings, the ProForm 505 CST is an ideal choice for entry-level individuals who are looking for a pocket-friendly fitness equipment. This is a fitness option that will present its users with excellent value. The warranty it comes with will save you greatly and is recommended for cardio training. The ProForm 505 is compatible with an iPod, and it features iFit compatibility to give you a wide range of workout options. 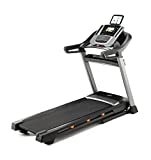 Moreover, it has great features that can only be found on high-end treadmills. Overall, the ProForm 505 CST is a reliable treadmill that will cater for your workout needs.